Gina Shelton, president of United Way of Bourbon County speaks to the Fort Scott Chamber of Commerce Thursday during its weekly coffee. 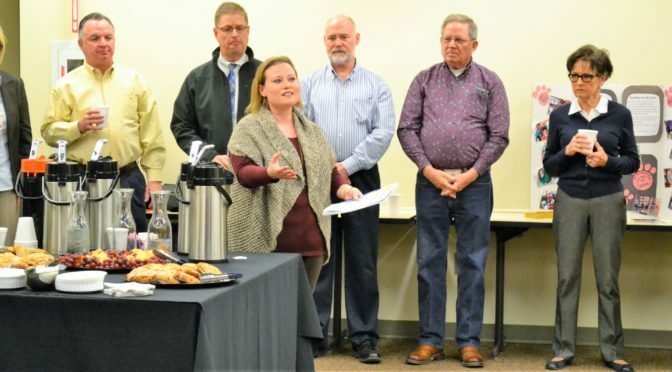 The United Way of Bourbon County kicked off its campaign at the Jan. 25 Fort Scott Chamber of Commerce weekly coffee, which was hosted by Mercy Hospital. Gina Shelton, president of the local United Way Board, said the best way to help in the fundraising is a payroll deduction. She said the cost of a purchased soft drink, $1 if it was payroll deducted by many people, would help the agency meet its 2018 Campaign goal of $50,000. Mother to Mother Ministries helps women build friendships across economic barriers as well as self-esteem and parenting skills. Diapers, baby supplies, and food to mothers in need are also provided. 620-224-0809 or 620-215-0924. Members of the United Way Board of Directors are Shelton, president; Dee Anne Miller, vice-president; Alene Jolly/Jodi Johnson, secretary; Devin Tally, treasurer; Jessica Werner; Vickie Chaplin; Amanda Lancaster; Mitzi Davis; Mert Barrows: Cindy Bowman; and Charli Bolinger.